Today we drew the lovely Amy. I was using Caran d’arch on 140# Kilimanjaro. Today was her fortieth birthday So HAPPY Birthday Amy. I started by drawing her first in with a yellow ochre caran d’ache crayon. I had actually brought my watercolor pencils to give them a go starting the picture but instead I grabbed the crayon and off I went. After I blocked in her head and measured her shoulders I just started adding colors. Most of her face was in heavy shadow.I probably should lighten the shadow under her nose and chin…looks like a goatee lol…BUT OH well..its a sketch and its DONE! 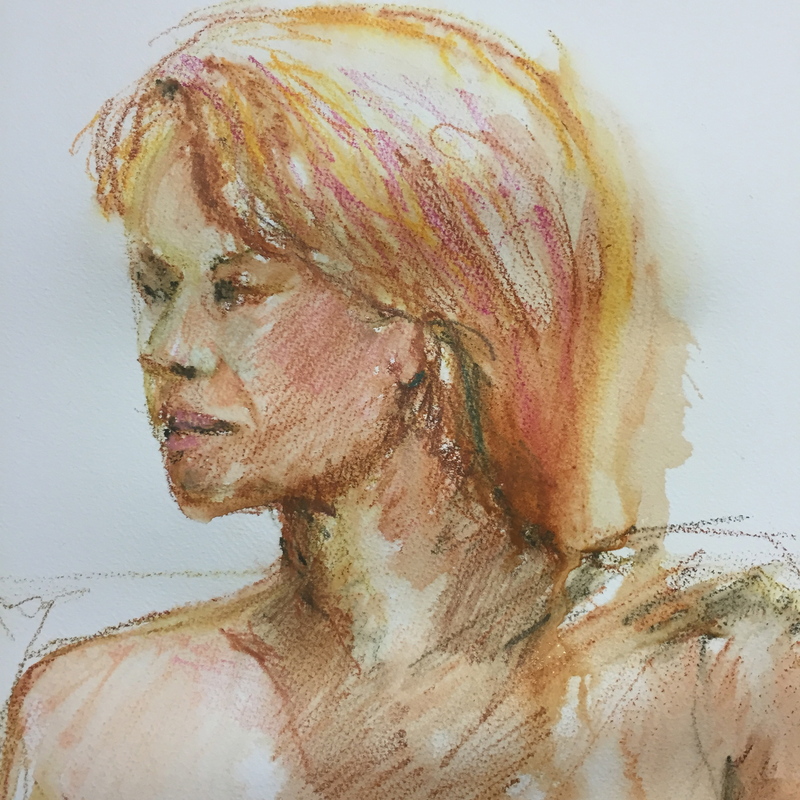 I should have followed Charles Reid Iconic Rule NEVER use anything darker than burnt sienna on a younger face…I used Burnt Umber…DUH!! It would be easy enough to fix. Just wet it down and wipe it off with a piece of bounty paper towel and recolor it with burnt sienna. MAYBE tomorrow or MAYBE NOT!! Thinking NOT!! She has beautiful red hair. A darkish auburn. I didnt have anything remotely resembling her hair color so I added some dark pink to the burnt sienna…even if it wasnt the right color it was fun!! A girl needs her pink! This is Amy after the first half an hour of drawing. Notice NO burnt umber under her lip. SO I guilted myself into getting up and lightening up the shadow on her face. I do have to say that its MUCH easier to lift color off the Fabriano coldpress than off the Kilimanjaro. I scurbbed it a little with my hogbristle brush and then added some flesh color to lighten it up. 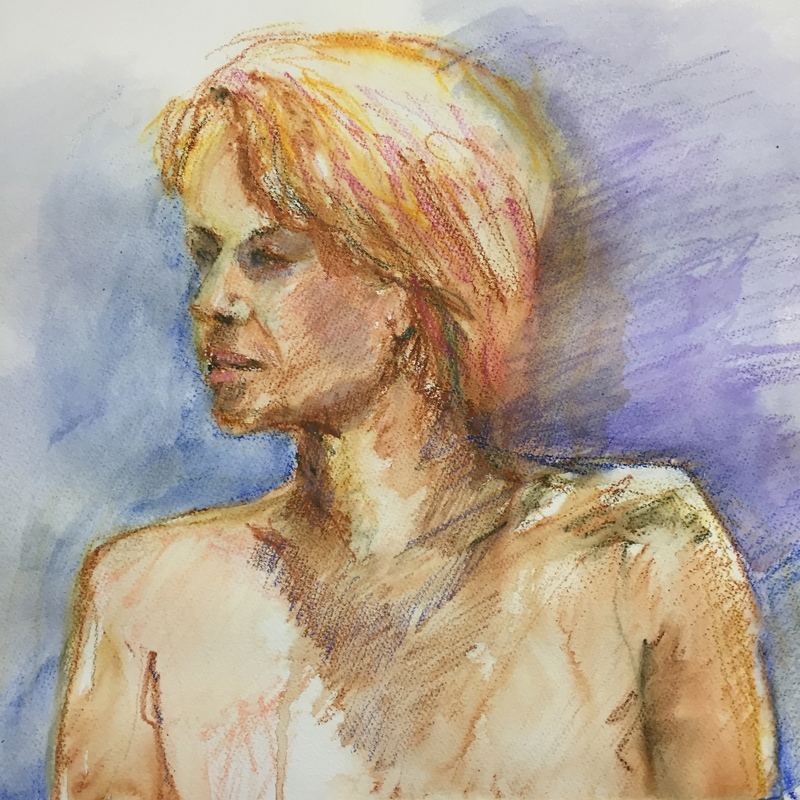 The caran d’ache are really like a cross between pastels and watercolor.They tend to be a little more opaque than the watercolors I usually use which can be a good thing or a bad thing depending on what you are doing. I also added more highlights to her face. Now I really am calling her done. I finished Amy about half way thru the second half hour session so I turned the board over and started playing with color on the other side. I sprayed it alot with water and had fun letting her drip. Added pinks to the ultramarine blues I was using. 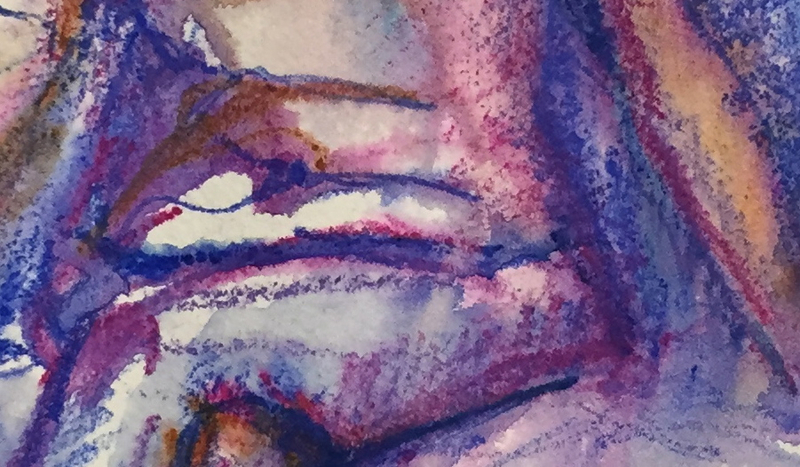 This is my favorite part of this sketch…arent the colors just gorgeous?? This is her tummy and her belly button in case you didnt know!! The model Amy actually bought this one from me…THANKS AMY!!! ANYWAY, Caran d’ache are ALOT of fun…go get a small box and have fun drawing. They keep you from getting too tight. Add in a spray bottle and it will produce some of the most delicious drips you have ever seen. At times I get bored drawing the birds on the back porch and I draw the squirrels. Actually they are easier to draw than the birds because the hold still sometimes for quite a while. The squirrels are drawn with Noodler Lexington Gray ink and are painted with watercolor. A combo of Quin Sienna and cerulean. I don’t understand why the Lexington Graybis waterproof while the supposedly Bulletproof black and the eelskin so not. So strange. Like a stupid head I drew one squirrel right in the center! A disaster!! I decided to paint over it with some of the Schminke gouache and yes it covered the squirrel completely!! Hurrah. Next came the trial of trying to write the words on it. Finally I got the Kuratake brush to write on the gouache zip zip it was done.